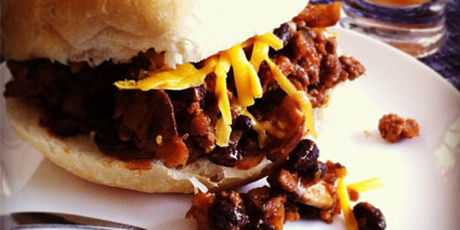 A beef, bean and mushroom mix set on a soft bun and topped with shredded cheese. Serve with a green salad and you have a fast, delicious finger-licking meal! 1. In a large skillet over medium heat, sauté the onion and garlic until they start to soften. Add the mushroom and continue to cook until the onion and mushrooms are golden. 2. While the onion mixture cooks, make your sauce. In a small bowl, whisk together tomato paste, BBQ powder, Worcestershire, brown sugar, white wine vinegar, salt and a generous squirt of ketchup. 3. Add the beef to the onion mixture and cook until no longer pink. Then add your sauce and 1 cup black beans. Cook until everything is heated through and well combined. 4. Serve on Kaiser buns with grated cheddar.